Many people ask what exactly is minimally invasive spine surgery? In just a few words, it is minimal cutting to avoid significant damages to the muscles surrounding the spine. The benefit to this is that it presents less risk for blood loss, a quicker recovery, less post-operative pain, less soft tissue damage and less chance for surgical complications. Most doctors prefer doing minimally invasive spine surgery if their patients are a candidate for it. In recent years, there has been advancement in MRI imaging that allows surgeons to see spinal nerves, small disc fragments and bone spurs. It gives them the ability to spread and push muscle out of the way as opposed to cutting through it and allows them to get to the exact place they need to. There are several different techniques surgeons utilize when doing a minimally invasive spine surgery. Some of them have become so precise that only a 1” incision is necessary. Common procedures such as fusions and decompression can be done in this manner, however, not all patients are candidates for this. Just like all patients are not candidates for minimally invasive surgery, not all surgeons are trained to do the techniques. It takes special training and skill and the right technology and tools to do these kinds of surgeries. If you have been advised to have spinal surgery and minimally invasive techniques have not been discussed, contact us for a second opinion. We have several facilities that can offer this kind of surgery and are happy to review your records. In the past few months you might have seen an increase in articles in the media warning about the dangers of Medical Travel to Mexico or Dominican Republic /or against traveling to Mexico or Dominican Republic for medical reasons. This includes a recent warning from the CDC not to have surgery in a specific region and hospital in Mexico and Dominican Republic. While there is a cause for concern, the results can be different, if you select a facility based on knowing what to watch out for. There can be dangers in Medical Travel but if you ask the right questions and verify the given information, those can be avoided. While cost is important it should not be your deciding factor. Many people think, it’s just breast implants or a simple hernia surgery. They do these every day. What could go wrong? If the right standards are not met, A LOT! Sometimes you get what you pay for and your health should not be compromised to save a few dollars. Having a safe, successful surgery should be your number 1 priority. That can be achieved if you gather all the facts. This can be incredibly time consuming but well worth the effort. Hiring a Medical Facilitator that does all of this for you will ensure no detail or question is left unanswered. It also gives you a guide through the entire process. If you are in need of such knowledge and expertise, contact Health Vantis today! The long and sometimes unbearable winters in Canada prompt many Canadians to head south for the winter. Many own homes or property down south and like to spend as much time as possible shedding their winter boots in exchange for flip flops. If they spend approximately 6 months in the US, they are often times labeled a Snowbird. One important thing all Snowbirds need to keep in mind is how many days they intend on staying in the US?. Canadians become confused about how long they can stay in the US. It is often thought that you can stay 6 months or 180 days. Per Gerry Scott, a Portfolio Manager and Branch Manager with Raymond James Ltd., this couldn’t be further from the truth. 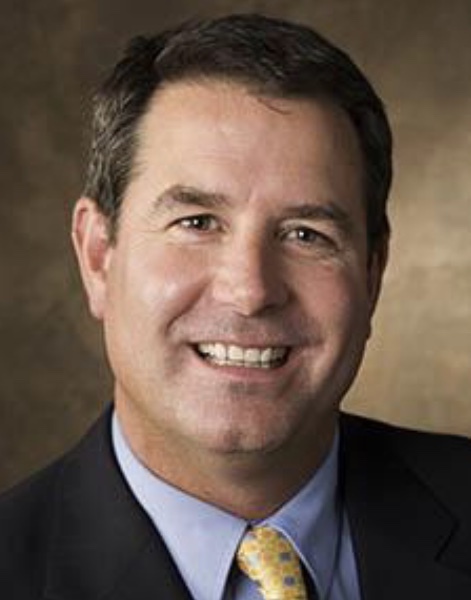 Gerry has spent over 23 years in the wealth management industry. During that time, he has met thousands of Canadians that either spend 6 months in the US, otherwise known as Snowbirds, or living in the US full-time. In his experience, most Snowbirds tend to avoid or not have a clear understanding of the US immigration and IRS tax rules that have changed in recent years. What Canadian snowbirds don’t realize is that they can be classified as a US resident and subject to IRS taxes if they stay too long. This is not tracked on an annual basis, but over a 3 year period and thus can be very confusing. Gerry also noticed that questions about estate taxes, home ownership, travel insurance or private health care often came up in his conversations.. That is when he decided to create an app that could point his customers in the right direction to answer their questions. The first version came out in the fall of 2015 and is called ‘Canadian Snowbirds US Stay Counter’. The app provided connection to US Real Estate, Tax & Legal Services, Medical Tourism and more. The thought was to have his current Snowbird customer base try it out and assist them with their US stay and answer other questions they might have. The app quickly became popular bringing in close to 50,000 subscribers. Fast forward to present day….Gerry has developed a new and improved app re-named ‘Snowbirds US Day Tracker’ with even more to offer people who frequent the US. The app came out last month and will have all of the useful information the previous app did and more. There will also be a website where you can get up to date information on the app. One other helpful tool it provides is getting the most out of your CAD currency exchange. Some banks will charge you fees as high as 3.1% on your conversion. Gerry has long term relationships with a Foreign National service that can offer the the best CAD to USD exchange rate for as little as 0.25% in banking fees by utilizing the app. That is a lot of money saved in the long run, especially if you are exchanging large sums. Be sure to download this free app in Google Play and the App Store. For more information or financial assistance, Gerry can be reached at 604-936-7529 or gerry.scott@snowbirdsapp.ca. If you are a Snowbird and are on a medical wait list in Canada, we can also assist with arranging your procedure, diagnostic test or surgery in a private manner while you are in the US. Contact Health Vantis for more details on this at info@healthvantis.com or 877-344-3544. Water is the most important nutrient human body needs?, water is the most important nutrient our bodies need. Approximately 60% of our body is made up of water, however, we constantly lose it through sweat, urine and even breathing. Humans can go weeks without food but can only survive 3-5 days without water. Experts say you should have 8-8oz glasses of water a day to appropriately replenish what your body loses. Many people don’t like to drink water or get bored of it because there is essentially no taste. 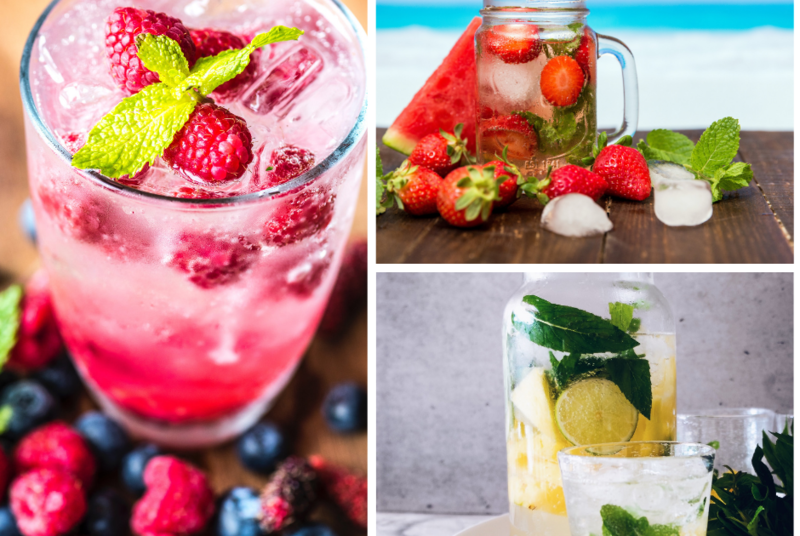 One way to change that is to flavor your water with fresh fruit. Not only does it provide more benefits, the concoctions are endless so you never get bored! Lemons – Support normal digestion, kidney and liver function and they are high in Vitamin C. It is also a natural fat burner. Citrus (ie. grapefruit or oranges) – Antioxidants and Vitamin C. It helps rid of toxins and waste from your cells. Oranges have also been proven to reduce the risk of stroke. Blueberries & Raspberries – Antioxidants and fiber which can help curb appetite. Cucumbers – Several vitamins, components that fight inflammation, protect brain health and even freshen breath. *Tip – Keep the skins on as that is where most of the vitamins come from! Mangos – Can boost metabolism, aid in digestion and increase memory and libido. Cranberry Juice (no sugar added and in small amounts) – It is loaded with antioxidants that help flush toxins from your kidneys and intestines. Apples – May reduce the risk of developing hypertension, diabetes and heart disease and provide iron to your diet. Kiwi – Contains a cleansing enzyme called actinidin which can give your skin a healthy, natural glow. Pears – They absorb glucose, which can give you more energy. Including fresh herbs such as mint, thyme or lavender can also give a very nice finishing touch to your creation! *Tip – Most fruit is not as tasty after being in water for hours. Instead of tossing it, include it into a smoothie along with some fresh fruit and voila’! World Health Day is celebrated on April 7th. 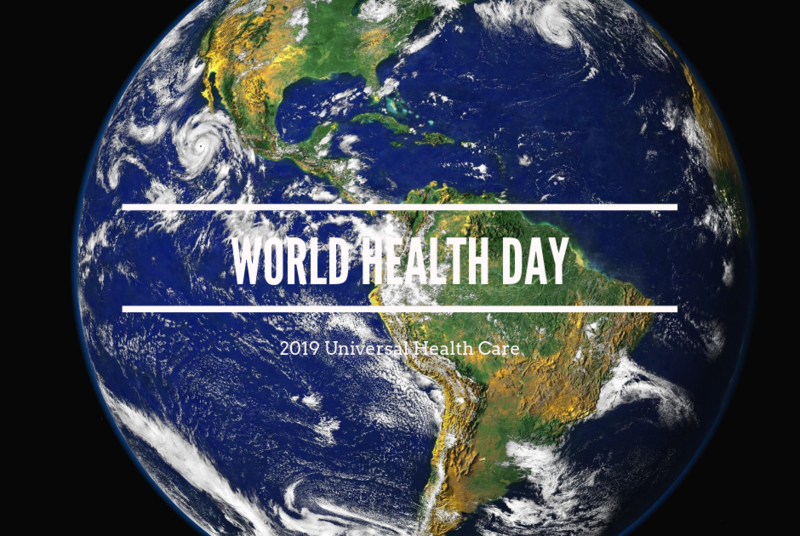 Each year the celebration highlights a specific theme that is a priority or area of concern for the World Health Organization (WHO). This year’s (2019) focus is on Universal Health Care (UHC). It is about the world coming together to ensure all people and communities have access to quality health care when they need it, without suffering financial hardship. The collaboration to improve UHC is to include a full spectrum from health promotion to prevention, treatment, rehabilitation, and palliative care. services and support that should be available. The campaign also gives an opportunity for Ministers of Health and other governmental decisions makers a chance to showcase what progress they have made in the past years as well as address the gaps they have in their respective countries. This would encompass all areas of Universal healthcare? quality, efficiency, equity, accountability, sustainability and resilience. Take the time to talk to your Ministry of Health or elected officials this year about your concerns in the gaps the Canadian healthcare system presents. Hearing from the people is where discussions start and change can happen. There are many ways to do a knee replacement. One of them is to have a custom knee replacement. While there are a couple of ways to have a custom knee replacement, Conformis is the only custom implant used. In a traditional knee implant, the implant designs are based on a set of pre-determined measurements. The doctor will determine which one is the closest fit for each patient. The flaw that can occur is that there are 2 joints in each knee and they can be different heights, which can result in an imperfect fit. It can also create more cutting of the bone depending on the surgeons technical abilities. There are other types of knee replacements that are ‘custom’. This does not mean that the implant is custom made to your knee. With this type of custom replacement, a MRI is done prior to the surgery to map the anatomy of the knee out. Specific cutting guides are designed to give the surgeon a more precise pattern to follow. It provides a guide for bone cuts around the knee which would be specific to the knee anatomy. This helps preserve as much of the natural knee as possible. A Conformis knee replacement is a custom implant specific to the patients anatomy. A 3D image of the patients knee will be done prior to the surgery through CT Scan. The image is used to design an implant that will fit their anatomy as well as design cutting guides for the surgeon to follow as in a custom knee replacement. It prevents the surgeon from removing bone and can correct alignment issues more reliably within the knee. Another bonus is that the implant itself is thinner in size, which allows for less healthy tissue and bone removal. The less bone removed, the less trauma the knee endures and less soft tissue disruption. The surgery itself is much quicker. You don’t have to try and fit the implants with off the shelf options or utilize stabilizing rods. It provides a more natural fit, less pain, swelling and faster recovery time. There will be less difficulties within the knee down the road and longer life of the implant. Our facilities are equipped to do all 3 forms of knee replacement. If you are on the wait list and want to explore your options, please contact us and we’d be happy to help! The US recently passed a law that requires hospitals to post their pricing. This was done so consumers could make an informed decision on where they are treated and what it would cost them. To the public this sounds like a great idea, right? However, this only confuses and complicates things further. US pricing of medical costs are complicated and far from straight forward! Up until now, you could google the cost of a procedure or service and would get a dozen different prices as answers. That is because US health care is so complex. There are websites out there that give you ranges of a service and what would be the high, low or fair price, however, these are often not updated or have inaccurate information. They also don’t account for insurance rates, bundled payments or cash customers. With the new law, the prices listed are not required to be written in plain language. They are only required to be ‘machine readable’ in the form of a spreadsheet. They do not include the prices insurance companies have negotiated nor do they give a price as a whole. You also need to understand how to read diagnosis codes to make sure you have the correct service. More times than not, there are other charges related to the service you need to be unaware of. For example, if you are looking to have a biopsy done, the cost is not just for the biopsy itself. There could be a facility charge, doctor’s fee and pathology fee that will be extra. Those often are billed separately which each item. The only sure way to know what the price is would be to know who to call and what to ask for but even then, you still might not get an accurate price. If you are considering coming to the US for a surgery or diagnostic test, contact a medical facilitator who is experienced in knowing how to get an accurate price. Health Vantis knows how to get this for you so you don’t spend countless hours going in circles.